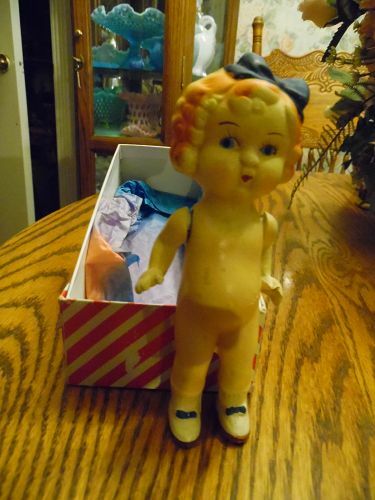 Shirley Temple carnival kewpie style doll made of porcelain but looks like composition because of the coloring. Pristine condition, paint is excellent, and measures 6" tall. Frozen body with moveable arms. 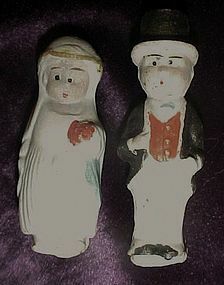 Little bisque doll, Marked Germany on head. This is such an adorable little doll. Hand painted head, hands and feet. Cloth body. I think her body is new. I know NOTHING about old dolls! But, this one does say Germany in the back of the neck and something elsle that looks like MED with in a square with other marks. Anyway she is cute and in perfect condition and is 10" tall. 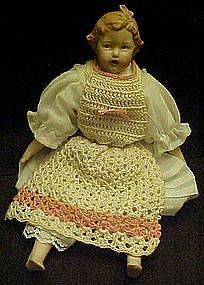 She does have a vintage crochet penafore on, with a white cotton dress, slip and pantallons. I'm just clueless to the age! You as a collector may be able to tell.